On August 17 I arrived again on Bali for the yearly visit of the Foundation to the schools and children. My first stop was Padangbai, on the east coast of Bali. On Sunday afternoon I was at White Sand beach, where I met all the children and their parents, gave them the money and made pictures. In the evening, just gone to my room in the hotel, I had a really frightening experience, when the walls of my bedroom started to move. A quite severe earthquake made the hotel tremble, and everybody hurried out to the beach. The epicentre was (again) near Lombok, but it was also quite heavily felt on this part of Bali. The next day I left for Pancasari, with a stopover in Ubud. In Pancasari I was the guest of Gita, our indispensable contact person for the schools and children we sponsor here. She lives with Glenn, her husband, in a nice villa with a view on the lake. Gita had prepared the visit perfectly; including the purchase of new laptops for the students going to class 10 (the first class of the senior high school). The visit to the schools went very well; the six children receiving the laptops were of course also very happy, and we could also include 8 more children into the Foundation. Then on to Lovina, where I stayed in hotel Rini this time. A first time in this hotel, which proved a really good choice; to be recommended when you stay in Lovina (Kalibukbuk). With our contact person Komang, I visited all the (primary) schools, checked the forms with the drawings and/or text for the sponsors, and took the pictures. Back in the hotel taking care of the administration, and putting the right forms and foto’s in the envelopes for the sponsors, was also quite a job. I frequently was in touch with Randy, our database manager, to communicate changes and updates for the database. With 220 children in the Foundation, and all the sponsors, a well-functioning data base and dito manager are indispensable! Later I visited the schools and children in Munduk Bestala, in the mountain area, together with Ari, who is our contact person there. On a Satuday afternoon all the children going to junior and senior high school came to the hotel. We had asked the owner, ibu Rini, if this was o.k., and she was happy to oblige. Because this is a big group of approx. 60 children, we had made a time schedule. By now, Hetty and our friend Ina, had also arrived in Lovina. Together with Komang and Hetty, we divided the tasks of checking the children, talking to them (we also stress the importance of at least a basic command of English to the children, and in meeting them, try to have a simple conversation with them in English). Since we have introduced a stimulus of an extra amount of money for students in class 10 and 12 if they can speak a little English, we have seen improvement J.
Needless to say, that the kids going to senior high school receiving the laptops, were very happy. On our way to Amed we visited one more sponsor child; he was at school in Munduk Bestala, but had to go to a children’s home because his grandmother, who took care of him, had died. We were impressed by what Ari is doing for this Foundation/home. After a few days in Amed, we went on to Ubud, where we sponsor four children. The last one, Emmawate, is not a child anymore. She was sponsored by Hetty during many years. She finished senior high school this year, and is now following a higher vocational nurse training. This is considerably more expensive than senior high school, and normally we do not sponsor after senior high school. But Hetty wanted to continue supporting her, and thanks to donations of guests at her party in June, this was possible. 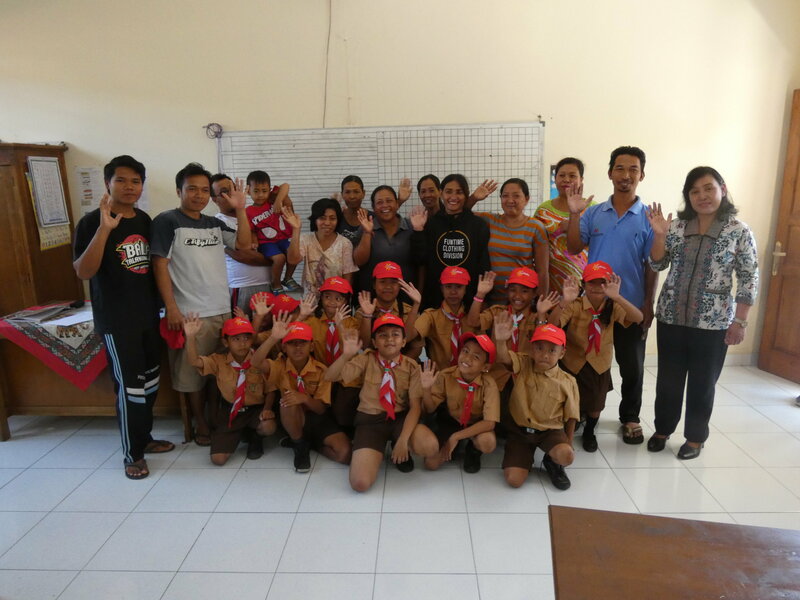 Our last stop was Sanur, where we met one more sponsor child and his parents. This boy, Ari, is sponsored by my brother Harm, and later on we also visited his school in Kuta. All the letters with information and foto of the children have been sent from Bali to the sponsors. We hope you have received them in good order, and that you like the update of ‘’your’’child or children. Sometimes sponsors ask us if we can give more details on the child, but this is really impossible with so many children and the relatively short time we are on Bali once a year. I can meet all the children and their parent(s), talk to the teachers, check if everything is o.k., and solve any problems. But more extensive information or more frequent updates, are not possible. It remains wonderful to be able to do this on behalf of all the sponsors, and the children and their parents are very happy with the support. So on behalf of all of them: thank you very much. Termia Kasih banyak! And if you plan to go to Bali at any point in time, and want to visit your sponsor child, do not hesitate to get in touch with us. We are happy to help, make appointments, and give you any relevant information and tips.